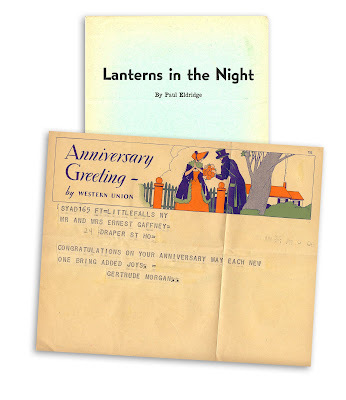 Found in "Lanterns in the Night" by Paul Eldridge. Published by Haldeman-Julius, Girard, Kansas, 1945. ED: Telegrams are great - can you still send them? Before I die, I'd like to get a telegram. In the final year of service, only 20,000 telegrams were sent. I also was a little sad that they disappeared. You can send an ARRL Radiogram via your local amateur radio operator, but it lacks the romance of an old Western Union one. It might end up that someone just calls you on the phone a reads a message to you. New rules: please send all blog comments in the form of a telegram. As I understand it, itelegram.com is the only place that will hand-deliver a telegram. I've only sent one in my life: to Hank Aaron the night he hit No. 715. I got a mailgram back a few days later saying thanks. I still have it somewhere. I've always wanted to receive a telegram and I never did. It seems so Old Hollywood (all those old movies I watch). I've also never received an aerogram (which the US Postal Service has also stopped selling). Try this one. You can send a telegram in any occasion you can imagine via telegramsonline. Try this one. You could send a telegram in any occasion you can imagine.